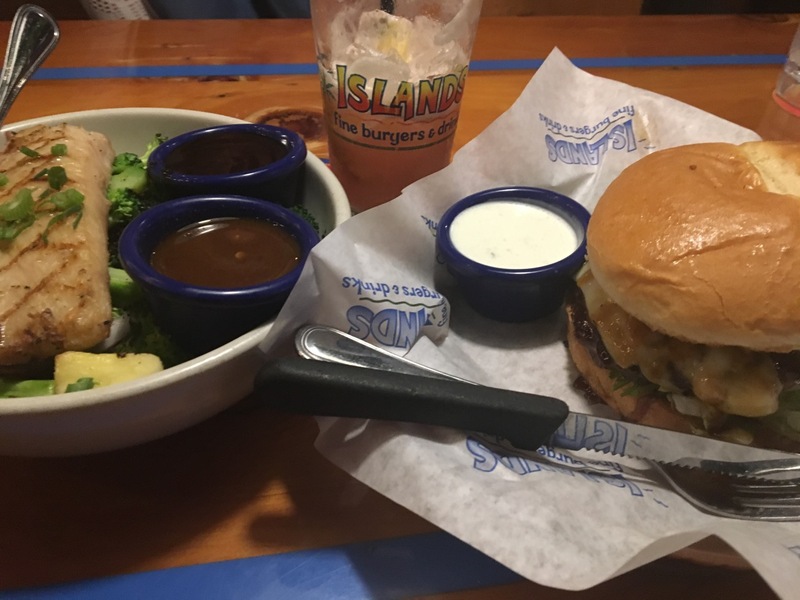 The sweet and savory Islands Hawaiian Burger and Hoisin Beach Bowl with mahi-mahi. I will admit up front that I’ve never been a fan of pairing pineapple with savory foods. On its own I love it. Nothing better than a slice fresh pineapple on its own or mixed into a fun cocktail. So when I heard Islands had a Pineapple Pairing Menu happening during the month of May, I thought it would be a perfect opportunity to cross that pineapple and savory threshold so I headed to their Encinitas location to give it a shot. First off, I did a bit of research on pineapples and discovered they do have some notable health benefits. This propaganda could all be drummed up by the pineapple growers but it was spread over several websites so there must be some validity to it. The benefits I found the most of related to respiratory health, improved digestion (pineapples are high in fiber), improved oral health, reduced inflammation and increased circulation. They have huge amounts of vitamin C with 131 percent of the daily value. That value goes down to 32 percent in canned pineapple, so stick with the fresh for the full vitamin C effect. Pineapples are also full of the enzyme bromelain, which has all kinds of benefits. Bottom line here is that pineapples are delicious and good for you. Historically, the most significant grower of pineapples was Hawaii, but they are now cultivated in large quantities in Brazil, the Philippines and Costa Rica. However, pineapples are actually native to Paraguay and Brazil. Got all that? Good. Synonymous with warm weather and beach days, sweet and tangy pineapples hit peak season from March through July. Islands restaurants, known for their surf-inspired menu and tropical drinks, is all about pineapples April 1 through May 31. Just FYI, Islands uses nearly 182,000 fresh pineapples per year in all of their restaurants. Pineapple lovers will find a Pineapple Pairing Menu with suggested pairings of popular pineapple dishes from the main menu. The pairings include the Hawaiian Burger, topped with fresh grilled pineapple and teriyaki sauce, paired with the Big Island Iced Tea. Yaki Tacos are topped with a house-made grilled pineapple salsa, served with a refreshing piña colada. The Hoisin Beach Bowl, made with chunks of fresh grilled pineapple and grilled vegetables, served over brown rice with mahi mahi or chicken comes with a signature Mai Tai. The Toucan Sandwich has teriyaki sauce, fresh pineapple, Swiss cheese, lettuce tomato and mayo and goes perfectly with a Longboard Lager. Each pairing is meant to complement the dish and bring out the sweet and savory goodness. Kids can join in on the fun with a themed coloring contest, which will also run through the end of May. To enter, kids simply design and decorate the pineapple coloring sheets provided in restaurant, and parents or legal guardians post the colorful creations to social media using #PineappleParadise and #IslandsBurgers for a chance to win $50 to Islands. Ten lucky winners will be selected. For kids who love pineapple, Islands Gremmie Menu features a dish popular with both kids and parents, fresh pineapple spears with yogurt dip. So I went for the Hawaiian Burger and can honestly say I really enjoyed it. I look at it like putting cranberries on turkey or lingonberries on Swedish meatballs, same concept. It was a very good burger. My guest went with the Hoisin Beach Bowl with mahi mahi, made with chunks of fresh grilled pineapple and grilled broccoli, served over brown rice. Seafood and fruit are more of a natural pairing for me and this was delicious. And while I love pina coladas, every time I have one I can’t help but thinking of the song from Rupert Holmes’ officially titled “Escape,” but known to most as the “Pina Colada Song.” It was only recently that I discovered what that song was about. I should note that all of the cocktails were tasty and that there is a full bar at Islands that is quite popular. Actually there is something for just about everyone on the menu at Islands. The simple, fresh ingredients found in its signature burgers are never frozen, fries are fresh cut daily and it’s a great place to watch a game or surf videos with a plethora of TVs. I’m not a big chain restaurant kind of guy, but Islands does it right. Follow Islands on Twitter and Instagram at @IslandsBurgers and like Islands at www.facebook.com/IslandsRestaurants. Don’t forget to share your favorite pineapple moments by using hashtags #PineappleParadise and #IslandsBurgers!